Earlier this year, HealthEast took advantage of a new contract with its food supplier Sodexo to connect the national food services corporation with The Good Acre, a local food hub adjacent to the Central Corridor. This innovative connection is setting off a chain recreation among CCAP health care partners interested in securing regional prosperity through increasing spend with local businesses, and may promise longer term local spend opportunities for other CCAP partners. Health care partners have an opportunity to shift 5% of their spend to local vendors and producers through this model of working with large food supply companies on strategic procurement. The Central Corridor Anchor Partnership has long identified local food as a priority focus for increasing local spend. All partners operate some level of food service for students, staff, or patients, and recognize that there is an abundance of locally produced food in our region. Increasing the amount of local food purchased takes collaboration over time, due to the structure through which our partners make food purchases. Most partner institutions utilize outside food service managers like Sodexo, Aramark and A’viands. Any increase in local purchasing must first go through these companies’ large national supply chains. The pioneering work by HealthEast and Sodexo in opening this supply chain has spurred similar investment by CCAP’s other health care partners. Regions/HealthPartners and Fairview are working to purchase more local produce through Sodexo, an opportunity enabled through Sodexo’s partnership with The Good Acre. The local food hub sub-contracts with immigrant, low-income, and independent farmers, including the Hmong American Farmers Association. There are typically 40 farmers supplying in a given season. The Good Acre, working as a broker of sorts, will supply Sodexo with two peak-season vegetables per month during the upcoming spring, summer, and fall 2017 growing seasons. Early plans call for Sodexo to buy more than 8,000 pounds of local produce through The Good Acre—a total value of approximately $20,000. The Good Acre has also begun discussions with U.S. Foods, which contracts with some health care partner institutions. “Ideally, HealthEast’s experience with Sodexo and The Good Acre will provide a framework for other partners as they continue to expand their focus on local purchasing,” said Swanholm. The local food purchasing program has the potential to grow in future years as more farmers meet the stringent food safety requirements of health care, and eventually, education institutions. The Good Acre has about ten food makers in the space right now who are looking to source more product. “We focus on local, produce-heavy food makers such as kimchi makers, salsa makers, and chutney makers,” said Mabe. Emily Paul, Program Director of The Good Acre, quickly converted the space into a teaching kitchen to the public as well as a space for food makers. The commercial kitchen runs two to five cooking classes each week, partnering with chefs from around the Metro area. “We just had Chris Uhrich from Mucci’s come in and teach a class about making gnocchi, fettuccini, and other Italian signatures,” commented Mabe. In the coming weeks, The Good Acre has Sara Johannes from Top Chef, Heidi Skoog from Serious Jam, and Restaurant Alma coming in to teach cooking classes to the public. The Good Acre recently partnered with Lakewinds Food Co-op for a maker-to-market program. “Lakewinds had some different products they were looking to source and source locally but found some holes in the market,” explained Mabe. “There are food makers out there that need some assistance scaling up to sell to co-ops and other institutions.” Out of 25 applicants, Lakewinds selected four. Lakewinds is helping these food makers with marketing, price points, and sourcing, while The Good Acre is providing distribution and distribution advice. By partnering around local food purchasing, providing a hub for food connections, and developing a dynamic commercial kitchen space, The Good Acre is bringing farmers, food makers, and communities together using a sustainable approach. During summer 2016, Augsburg College exceeded the Central Corridor Anchor Partnership’s inclusionary contracting goal to award a minimum of 10% of total project cost to local, women or minority owned firms in a major construction project. McGough Construction, the general contractor working on Augsburg College’s Hagfors Center for Science, Business and Religion, relied on almost 13% local, women, or minority owned firms to complete the project—an economic value of $6,762,287. The largest of these contracts was over $3 million to Twin City Glass Contractors, a woman-owned business located in the Central Corridor. 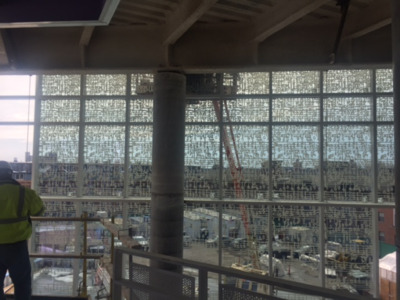 Now, that glass is being installed as the Hagfors Center moves a step closer to completion. Sue Wohlk, CFO of Twin City Glass was pleased with CCAP’s commitment. “We greatly appreciated the opportunity to be part of this,” she stated. 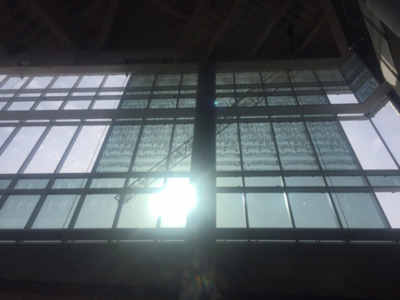 “And we hope to be included in future CCAP projects.” The company provides glass, glazing, aluminum curtainwall and storefronts throughout the region. The Central Corridor Anchor Partnership (CCAP) seeks to secure regional prosperity in part through spending more with Central Corridor businesses. CCAP has developed several initiatives to create wealth in communities adjacent to the Central Corridor by focusing and aggregating the demand from the Anchor institutions to local suppliers that employ and invest in the community. Augsburg College is the first CCAP member to utilize the Partnership’s inclusionary contracting policy adopted in December 2014. The policy calls for CCAP members to consider adding contract language on large capital projects of $250,000 or greater that commits to utilizing local, women or minority owned firms for a minimum of 10% of total project cost. Many of CCAP’s public members have committed to similar goals through state contracting requirements. Public institutions and other larger private business corporations in the Twin Cities region have successfully developed best practices and managed economic inclusion policies and programs utilizing Minority Business Enterprises (MBE) and other targeted vendors for many years. General contractors in the region are familiar with economic inclusion policies that target Local Business Enterprises (LBEs) and MBEs and are capable of fulfilling the requirements of such policies without creating significant additional costs. McGough’s other contracts to MBE firms were for trucking, structural steel and concrete. Looking ahead, McGough expects local and MBE firms to participate in mechanical and fire protection and electric contracts. CCAP health care partners are going local with their food purchasing. From working through food supplier Sodexo to one-on-one procurement with local producers, health care partners are serious about buying local. Three CCAP health care partners are working with Sodexo to purchase food through more local vendors. Sodexo is tracking purchase locality by asking vendors that sell to Sodexo to provide data on purchases within CCAP zip codes. Once this baseline data on purchase locality is available, Sodexo will seek to add more local vendors in different purchasing categories. Other partners are working with individual local vendors to secure food purchases. HealthPartners is now buying from Urban Organics located on the east side of Saint Paul. This year-round supplier of fresh produce is proving a good fit for serving several smaller HealthPartners hospitals. HealthPartners look to supply other locations within its network through Urban Organics, and may also begin purchasing fish from the vendor. HealthEast purchasing staff are in talks with The Good Acre, a non-profit food hub. The supplier is located in the Central Corridor and provides facilities, warehouse space, transportation assistance, cooler and freezer storage space, and wholesale distribution to low-income, immigrant independent farmers.